Squirrel Talk: Turn the Gasmen off! The first day of the 20th J league season dawned a dismal, grey and drizzly day which didn't seem to bode well for the football to come, and I found myself heading to Kawasaki for a lesson and without a ticket for the big game at the Nack 5, where Omiya Ardija would entertain FC Tokyo, for whom it would be their first game back in the top flight after a very successful season down in the second tier of Japanese football, J2. As I headed back to Saitama after my lesson ( easy, fun gig!) I found out that the game was sold out and my hopes of gaining a late ticket to the game were all but sunk. However just as my wife turned to leave the Orange shop a lady who had a spare ticket, offered it to my wife for free. and in a flash ( and an SMS text!) I was in. Happy Orange as the advertising goes. So I got off the train, picked up my ticket, said goodbye (and profuse thanks) to my wife and set off cheerily towards the stadium. Once there, and having gratefully collected my free Orange supporters bag and sundry free handouts, I found a seat high up in the stand behind the goal, which I quickly bagged before heading to get a beer. For those of you from England who have never been to a Japanese football game, one of the best parts of the experience is that you can buy a beer and enjoy supping it while watching the game from your seat. So there I was, drinking my beer, tweeting and trying to video from my iPhone the FC Tokyo fans' rendition of the Liverpool Kop classic You'll never Walk Alone, when the fan next to me had to leave to answer his mobile phone, and you guessed it, bang went my beer, all over the floor and only a quarter of it had been drunk. Well, to say I was gutted, would be an understatement, but I kept my cool, after all it was totally my fault. It had been my foot that had done the dirty deed, and so I resumed to concentrate on the game. But before the game could start, there was a minute's silence to pay respects to those that lost their lives in the terrible earthquake and tsunami which devastated great parts of North Eastern Tohoku last year on March 11th. The minute of respect was observed impeccably and personally I was glad to see that J League fans continued with silence rather than the applause which seems to have gained popularity recently at football grounds in England. I can see that there are arguments in favour of both, however I contend that the applause is used mostly to cover up the idiots who can't remain silent for a minute, and that it's feeling is less respectful. That's my opinion and I wonder what others think. Following that, everyone was ready for the game. The stands were full, the fans were in good voice and the ref was about to whistle to kick off the season. As quick as my beer had been lost, Omiya were on the attack when Higashi pounced on a Kaga error, but his shot was saved by Gonda. From that surprising start, Omiya took the initiative, attempting to keep possession away from FC Tokyo's danger players and with some enterprising quick passes up front started to set up chances which only great work from goalkeeper Gonda, kept Ardija from taking the lead. The best of Gonda's work was a double save from Cho Yong Cheol and at that point confidence was rising that Ardija might actually start their season with a win. Chances kept coming and Rafael went very close on the right with a sliding shot which just went wide. With so many opportunities going begging, Omiya fans must have been starting to get that sinking feeling that it just wasn't going to be there day, and on past results, who could really blame them. The last fifteen minutes of the half seemed to bear this out as the Gasmen from Tokyo started to gain a footing in the game and a big chance on a breakaway for Tokyo was wasted by Yazawa who shot poorly and the ball went well wide of the Kitano's goal to the relief of the home fans. So we went into half time with honours even at 0-0, and I quickly headed to the area under the stand to relax and join the queue for the toilet. When I got back to my seat, just a few moments after the restart, I found to my surprise that the man sitting next to me was holding out a beer for me! I was , to say the least, gobsmacked. I gratefully received the beer, said my best polite thank yous in my poor Japanese, smiled, said 'Kanpai' or cheers and we both settled into our seats to enjoy the 2nd half. He really did not need to buy me that beer, it wasn't his fault at all, and happened all because of my clumsiness, however it reminded me for the second time today of the reasons why I love Japan. Back to the game, and Omiya continued to play the same brand of passing and possession football, and Rafael came very close to scoring close in on Gonda's goal. Although FC Tokyo were seeing more of the ball, they still hadn't created much apart from the chance in the first half wasted by Yazawa, when in the 61st minute Lucas turned the game on it's head and scored what turned out to be the only goal of the game with what I can only describe as a wonder goal and one that honestly deserved to win a match. He controlled the ball, turned and volleyed the ball home with style, Kitano in the Omiya goal well beaten. Lucas' goal was a strike that would have beaten keepers of a far higher reputation than Kitano. For much of the next 30 minutes, Omiya seemed to have had the wind taken out of their sails, and FC Tokyo found it easier to keep the ball and plot some attacks on Kitano's goal, without really seriously threatening to get a second goal.The squirrels never quite gave up and launched some attacks on Gonda's goal which caused the keeper some consternation, and although he wasn't beaten in the second half, his performance was far from the high standards he set in the first half. Too many times he rushed out of his area and failed to clear comfortably causing understandable panic in his defenders and some ribald comments from Omiya fans in the seats around me. Omiya did get the ball in the back of the net but the referee disallowed it for handball. Towards the end of the game, as the minutes for added time ticked by, frustratingly, Omiya players wasted the ball or were too slow in delivering their passes, something which I can never understand, and then time was up and the 3 points went to the Gasmen. 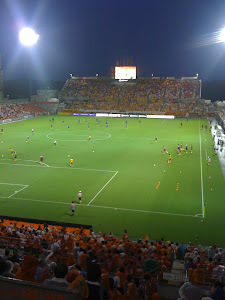 Although Omiya Ardija lost, failing to turn the gasmen off, and I am still disappointed by that, the performance hinted at a brighter season than last year at the Nack 5. There is work to be done, no doubt, manager Jun Suzuki needs to work out quickly, and find the balance between using swifter, younger, creative players against those with less skill and speed, but who might help protect a lead later on in games, if Ardija can get into a winning position in games. Finally it had been a great night out, which had reminded me. even on the eve of the anniversary of the country's worst national disaster, just why I continue to live here. Let's go Omiya! Ganbare Nihon! Very interesting blog Steve, gives fans a great insight into what's going on in other parts of the footballing world. I couldn't agree more with your view of the minute silence. It's the perfect way to pay respect and by changing it to a minutes applause,we are allowing the minority dictate to he majority!! I have never really watched Japanese football, apart from the odd highlights package, but after reading your blog I'll pay more attention to it....keep the updates coming. Good work. Thanks for the comment, Dave. I appreciate that. I'll try to make comments as and when I can. In previous seasons I have watched more on TV than in the stadium to be honest but this season I want to try to get to more games of my local team, Omiya Ardija. We'll see. As for Japanese football, it's worth a look. Their skills with the ball to feet are quite impressive. The game has improved year on year that I have been here.